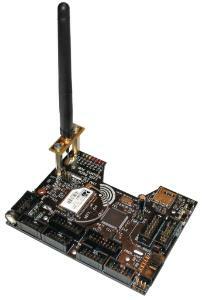 This very powerful expansion board can be used to add a wireless network (WLAN) connection to the RP6v2 Robotic Vehicle, available separately. It contains the largest ATMEGA AVR processor, microSD card storage expansion, and 60 I/O ports with several special features. This controller features a higher clock frequency and eight time more SRAM and Flash Memory than standard models. The Motor Control, ACS, IRCOMM, etc. can be handled by the controller on the mainboard, enabling more free processing time.